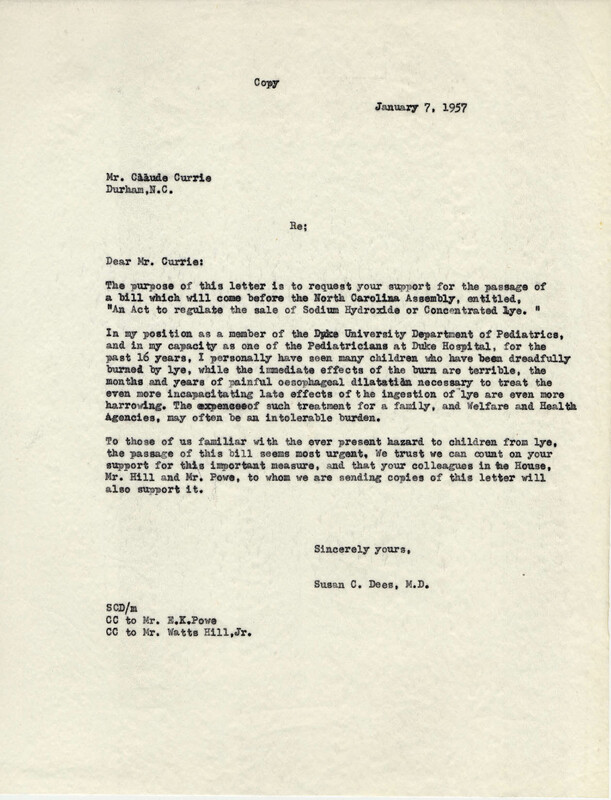 Dr. Jay Arena came to Duke in 1930 as a medical student of the first class at Duke Medical School. Dr. Arena is credited with beginning the poison control movement in the United States and persuading drug companies to develop the childproof safety cap. Throughout his career, Dr. Arena served the fields of poison control and pediatrics. 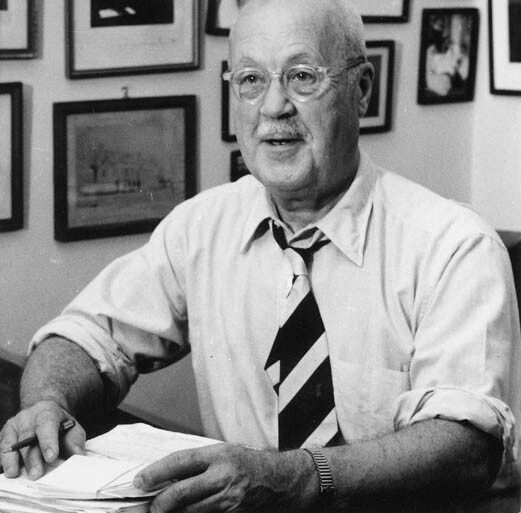 He held many positions, including president, of the American Association of Poison Control Centers as well as the American Academy of Pediatrics. Dr. 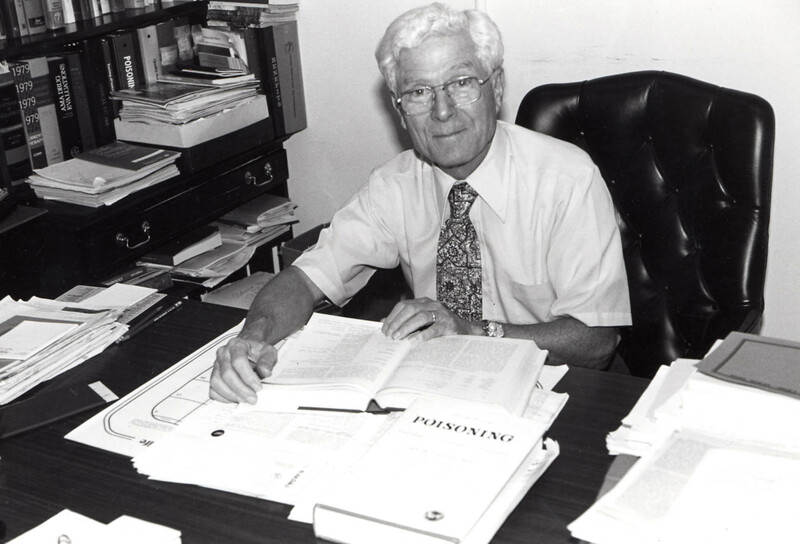 Arena published approximately 300 articles and pamphlets on poisoning and a variety of pediatric subjects. He also was author, coauthor, or editor of numerous books on similar topics. Listen to Dr. Arena speak about his internship in Duke's Department of Pediatrics. "Lye, which will 'eat the stains from the boiling kettle,' will have a much direr effect on the oral or esophageal mucosa." --Kernodle, Taylor, Davison, 1948 article in American Journal of Diseases in Children. Dr. Jay Arena and Dr. Wilburt Davison note the dangers of lye poisoning. Dr. Wilburt Davison, Dean of Duke Medical School and pediatrician. Listen to Dr. Arena speak about his first interactions with lye patients and his consistent crusade against the home use of lye. 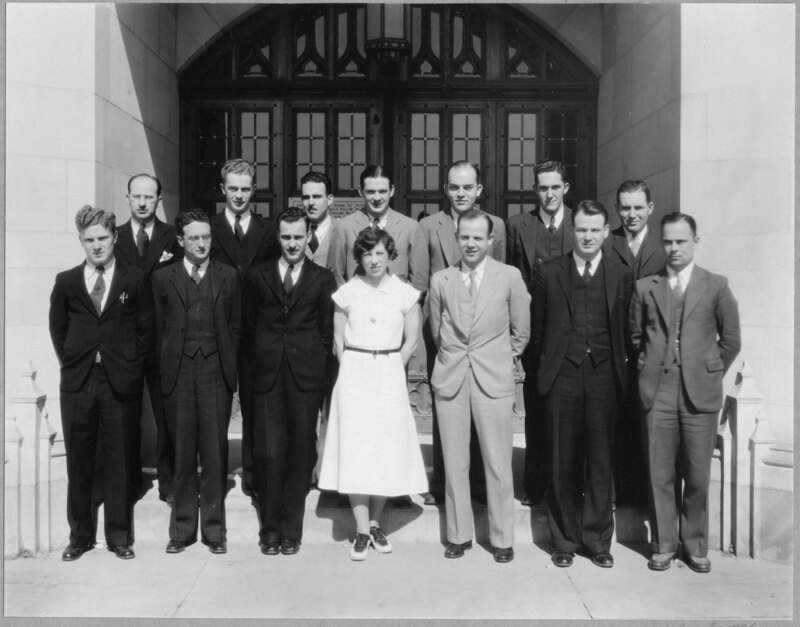 Dr. Wilburt Davison and resident Dr. Jay Arena began work in the Department of Pediatrics at Duke in the 1930s. 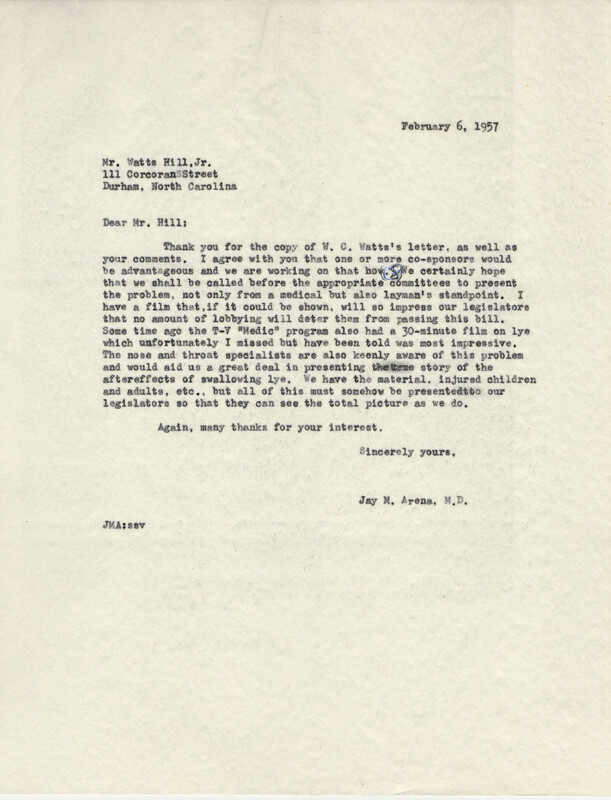 A trend that they followed with alarm during this time, and one which continued for decades in North Carolina, was the high incidence of young patients who had swallowed lye (some of these thought it looked like milk when it was in solution). These children were suffering from severe esophageal burns. Parents were using lye effectively as a cleansing agent, but its presence in the home was a danger. Between 1930 and 1950, for example, there had been 285 cases of lye poisonings at Duke Hospital. As his career at Duke grew, Dr. 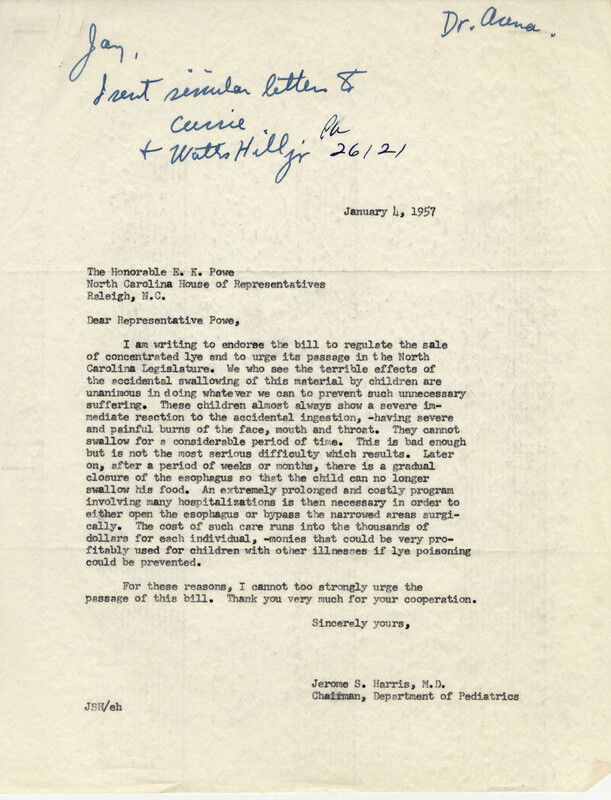 Arena became an outspoken advocate for legally banning the sale of lye for home use, and he worked with public servants such as Watts Hill, Jr. to continue to introduce "the lye bill" in North Carolina legislature. It was Dr. Arena's concern for lye patients that began his lifelong interest in poison control. In 1957, Dr. Arena and Duke colleagues Dr. Susan Dees and Dr. Jerome Harris express their support of the "lye bill," or HB No. 867, "A Bill to be Entitled an Act to Regulate the Sale of Sodium Hydroxide, or Concentrated Lye." When the bill is not passed in 1957, Dr. Arena continues to work with concerned activists on a bill to present at an upcoming session of the House.